Weeklong stay Sunday to Sunday — 8 days, 7 nights, 6 riding days. SuusLodge offers the best snowcatskiing on the powder-laden, completely virgin slopes of Suusamyr-Too and Kyrghyz Range. Skiers with the sense of adventure, who are looking for an escape from civilization, lifts, line-ups and crowds, will be pleasantly rewarded. 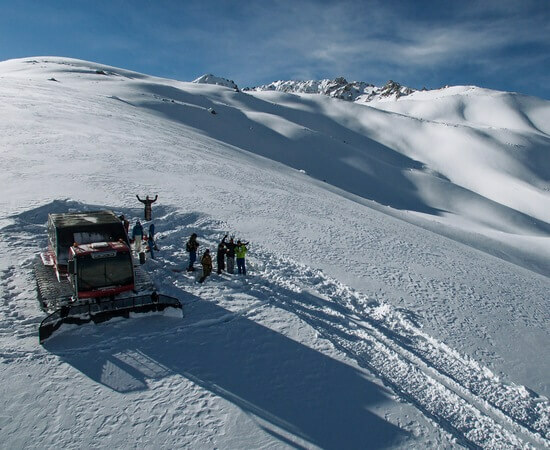 (Snowcat is an enclosed-cab, truck-sized, fully traced vehicle with a passenger cabin for 12 people, used to take the skiers/snowboarders up to the point of descent).